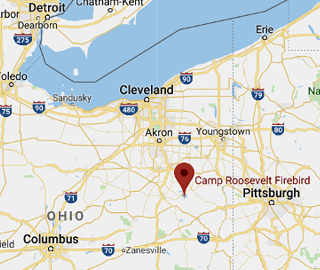 Welcome to Camp Roosevelt-Firebird, Ohio’s Best Summer Sleep Away Camp! 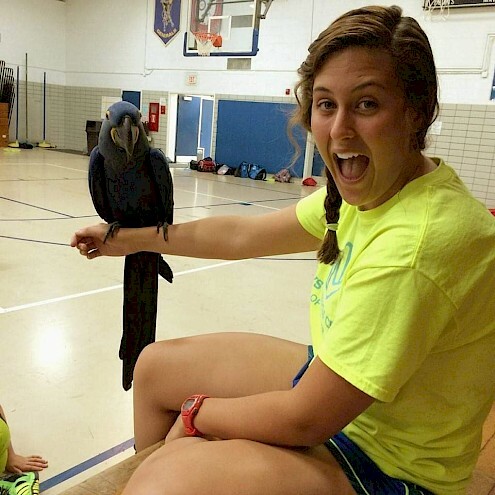 Since 1918, Camp Roosevelt-Firebird has been creating fun, memories and lifelong friendships. We provide a wide variety of fun and meaningful activities in a caring environment. Our program fosters self-confidence, leadership, respect, creativity, and humor. Campers gain an appreciation for the environment, diversity and making the world a better place. Our sleep away summer camp is located in the beautiful rolling foothills of Ohio’s Allegheny Mountains, just a short distance from the Cleveland, Columbus, Cincinnati, and Pittsburgh areas! Lake, field, forest, court, and barn … we’ve got it all -- great activities and experiences for our summer sleepaway campers! Our energetic staff creates imaginative, silly and offbeat games. We put our own spin on the normal to make it extraordinary. It might start as a carnival, a relay race, a campfire, a dance or soccer game but then… we suddenly dress up, act goofy and let it all hang out. The bottom line is: We know how to play. Learn more about our activities here! Summer camp is a time to break away from rigid schedules. Campers choose two supervised activities every morning that last a few days. They have structured free time every afternoon where they choose from a menu of possibilities. Once a week, cabin groups plan their own day of activity. Before your child even attends summer camp, we do our best to visit your home to get to know you. We try to match up your child with a “buddy camper” from your town. We constantly consult with a child’s parents, counselors and his/her friends at camp. 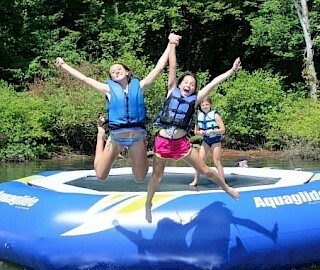 We keep tabs on how each child is adjusting and experiencing summer camp. We observe them, talk with them and do our best to develop relationships. In this way, over days and even years, each individual camper’s strengths come to light. Our focus is to help your child grow. Staff guide activity choices and encourage summer campers to try new things: a mountain bike ride in the woods, fishing, zip lining, etc. A camper might read a poem in front of 100 people, speak out in a cabin discussion, lead a dance group or come up with an activity of his/her own. All kids are recognized and encouraged at our “formation” meeting twice a day. Counselors create a safe and respectful environment that allows them to make friendships and resolve cabin conflicts. We're a team. Everyone does chores and plays a part. We welcome suggestions to improve life at summer camp. Campers might paint a cabin or build a new hiking trail. Together, we create exciting programs and solve problems. We're very diverse and this sets us apart. 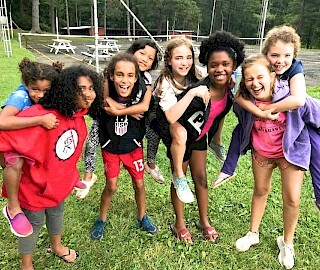 Our campers and staff come from all walks of life; camp is inclusive, multicultural, international and draws from across the socioeconomic spectrum. We're green! We grow food on our small farm and carefully raise animals. We compost waste, recycle what we can and minimize our use of natural resources. We do our best to care for each other and our natural environment. We take time to reflect. 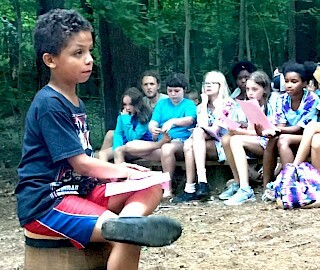 We have weekly values based campfires that inspire our campers to make a difference at camp and in the larger world. We offer opportunities for community service. Our sleep away summer camp is located in the beautiful rolling foothills of Ohio’s Allegheny Mountains, just a short distance from the Cleveland, Columbus, Cincinnati, and Pittsburgh areas! Kids from all over the world come to our overnight summer camp - we have a good number of international campers every summer -- but our location is especially convenient to those living in the midwest. Grayson is in the house! Meet Grayson Blythe. She is our new Program and C.I.T. Director. Double trouble. She has experience, charisma and a great laugh. Can't wait to play with her this summer. Read all about her in the extended Facebook Post. Click the link. Abi attends Exeter University in the UK. But the important thing is: SHE'S COMING TO CAMP THIS SUMMER! 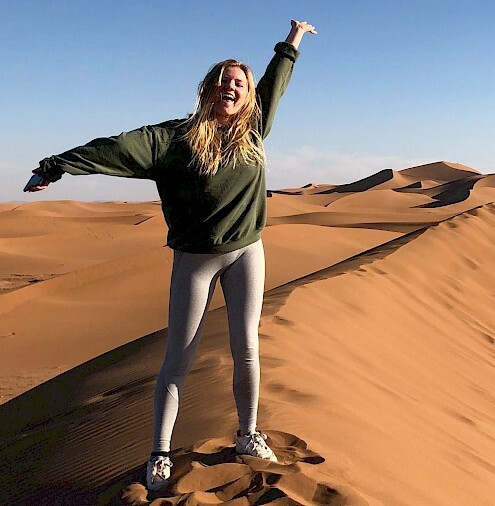 She is searching the desert in Morrocco for the best camp games . . . .